PoPville » Scuttlebutt: Piola Pizzeria Coming to 14th and V St, NW? Scuttlebutt: Piola Pizzeria Coming to 14th and V St, NW? A reader sends in word that Piola Pizzeria has signed a lease at the corner of 14th and V St, NW. Back in Sept. 10 we learned that this corner was going to become a Tex Mex restaurant however there has been very little movement since them. Many folks have been writing in asking what was going on here. I’ll be sure to keep my eye on this corner. Piola’s cuisine is rigorously Italian: Simple and healthy. Piola’s pizza is thin-crust and well cooked, but above all, Piola’s pizza menu is very creative: the classic Italian pizzas are flanked by many other creations, all delicious and original. Piola opens its doors to culture, hosting film premieres, book and magazine events, art exhibitions and many other social and artistic activities. Has anyone ever eaten at their Arlington, VA location? 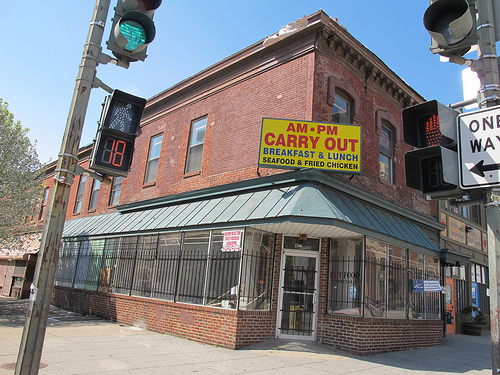 It seems like a good pizza place would do well on the 14th St, NW corridor. I give this scuttlebutt a 72% accuracy rating and will be sure to update when more info becomes available.